Place half of rosemary sprigs in a single layer in the center of a baking pan. Place sliced red onion ontop of the rosemary. Place salmon filet on top of the onion with skin side down. Sprinkle salmon with salt and pepper. Cover salmon with remainder of rosemary sprigs. Place lemon slices over rosemary. Drizzle olive oil over filet. 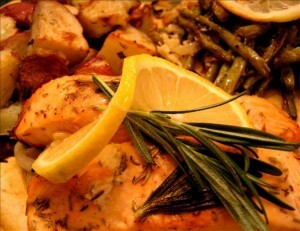 In a preheated 500 degree oven, roast salmon for about 20 minutes or until cooked through. Serve salmon with onion and lemon.